Amanda M. Schreiner: Shelby Hope's Dramatic Birth - She's Here! “Your husband said you’d want to nurse her right away … would you like to do that now?” Needless to say, Tim is my hero. 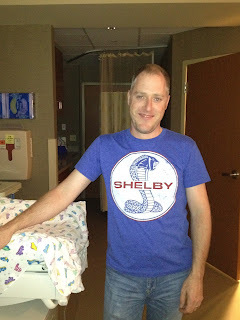 He was with Shelby the moment they let him be in the nursery. Thanks to my family eagerly watching through the nursery windows I have pictures of some of those first sweet moments. I later found out Carrie called from the surgery to let him hear Shelby crying for the first time. First I remember seeing dark hair, still damp and slightly curled. And tiny, perfect fingers. We needed no introduction … the nurses helped me on my side to nurse her, and she immediately found me and latched on like a champ. Our daughter. The days following were a frustrating blur, but the hospital was amazing about letting Shelby and Tim stay with me as we waited for my blood pressure to stabilize. Coming home was a shock … “home” the day I left work was the second story of an apartment and a downstairs neighbor named Phil … now home was a restored Craftsman in a small town. I walked gingerly into my new life with our parents greeting us on our new front porch … carrying our new family member in my arms. I don't have the wonderful proud papa pictures, so until I find them here is Shelby's first bath! I will never be able to thank everyone involved enough ... our family, our selfless friends who not only helped us move, kept us company, and communicated for us, but also who filled our freezer so we didn't have to worry about food that first month ... and the protection of a God who loves us. Thank you for praying with us - we have a lot to be thankful for this year!